Oh, October. It’s such an animated time of year with bustling ideas, parties, and fun. Childhood-like energy vivaciously radiates through joyful smiles. Adults passionately reminisce their childhood days as they blissfully entice little ghosts and goblins with both tricks and treats. Pumpkins and scarecrows eagerly collect their sweet treats with spooky smirks. Everyone – young and young at heart, finds enjoyment in the frightening fun of happy hauntings and petrifying parties! Host a Pumpkin Carving Party! October is adorned with straw, warm colored mums, gourds, and pumpkins. What better way to decorate your haunted house than with a pumpkin, perfectly carved out by your munchkin. Watch the faces of your favorite little ghouls light up with excitement when they come to your pumpkin carving party! Get as creepily creative as you’d like! When planning a pumpkin carving party, it is important to set the date to your evening of thrills. Consider a night when the weather is not too brisk, you’ll likely want to host the fun in your garage for easy clean up, and you’ll avoid the hands of your little ones getting too cold while they are playing in the pumpkin goo. The weather may be unavoidable in the event you want to show off your creativity at Halloween; pumpkins don’t last long once they’ve been carved. Purchase and prepare your Halloween party invites with details. Don’t forget to include RSVP information; you’ll need it to prepare your party. Send out your party invites to all of your guest goblins. Give your little werewolf something to howl about! After your guest goblins have returned their RSVPs, it is time to prepare for your party. Stop by your local Farmer’s Market and purchase one carving-size pumpkin for each of your guests. You may want to have a couple extra on hand, too. If you don’t use them at the party, you can always place them out to embellish your home during the holidays. Pick up some pumpkin carving kits – remember to have enough carving utensils on hand for each of your guests. Decorate your garage into a Halloween scene with fun room transformers such as Jack O Lantern Scene Setters or Pumpkin Paper Lanterns. Let your creativity be your guide! Add some fun to the party and lay out some pumpkin shaped goodie bags for the guest goblins. Include nose glasses and Halloween party favors. 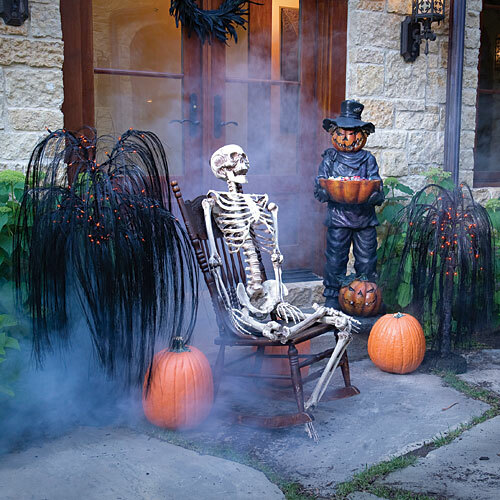 Jazz up your party with some eerie edibles – try your bones at making a pumpkin cake (you can add some fun with an iridescent Jack O Lantern pan). Remember your Halloween themed plates, napkins, tableware, and plastic ware if you will have edibles. Let your heart go wild; just don’t let the vampires in! For easy clean up, lay a large tarp down on your garage floor. When the evening is over, you will have less gooey pumpkin guts to worry about. Consider decorating a corner of the garage with little hay stacks and straw or potting plants of mums. Place the pumpkins in a pile to create a pumpkin patch. Let the kids have fun picking their favorite pumpkin. You may even want to set the mood of the party by playing a Halloween CD. Let your guests have a gooey good time carving their pumpkin! After your little goblin guests have finished with their spooky carving fun, let them take their personalized pumpkin home as a party favor. You will likely be the hit of Halloween! Jewelry is always fun and can be worn for the entire Halloween season for years to come! For example, Skull Rings are adjustable rings in bright silver, and Crawlie Rings looks like black spiders crawling up your finger. Kids love temporary tattoos. They’re easy and safe to apply and last for a couple of days. Simply apply to cheek, arm, or hand with water. There are a variety of styles to choose from, and it won’t cause anyone to get a cavity! Trick-or-treaters might want to use this treat right away! Glow Sticks will light up their night in colors like blue, orange, purple, green, pink or yellow. Parents will appreciate their glow and help them keep a better eye on trick-or-treaters after dark. Alternatives to sticks are Glow Bracelets. If you insist on handing out some sort of edible treat on Halloween, it doesn’t have to be candy. In order to be safe though, make sure your snacks are prepackaged. Some healthy treats that come prepackaged are raisins, pretzels, dried fruit, granola bars, trail mix, and sugar-free gum. Give kids some Vampire Fangs to see what it’s like to be Dracula for the night. The white fangs will fit the mouths of most children. They are also available in glow-in-the-dark. When purchased in large quantities, school supplies are low-cost. Some ideas are Crayon Erasers, pencils, or pens. Kids love to throw and bounce things. Have them channel their Halloween energy into a marble bounce ball. They have the look of real marbles and come in a variety of colors. No matter the amount, children are always thrilled to get money. Have a big jar of change just sitting around? Pass it out at Halloween. Some trick-or-treaters might get a penny and others a quarter. It will be part of the surprise! Coloring books are a great alternative to candy at Halloween. Not only is it a non-edible item, but it also gives children a chance to be creative. Help keep trick-or-treaters hydrated by passing out mini bottles of water. Large quantities of mini bottles can be purchased at a wholesaler near you. Whatever you pass out this Halloween, make sure it is safe and appropriate for the many ages of trick-or-treaters. Want to really creep out your Halloween party guests? Don’t just serve cookies and punch. Take things a bit further with some creepy Halloween party snacks. Instead of throwing cans of your favorite beverages in a cooler or ice bucket, have them guarded by a spooky witch, who will keep your drinks chilled in her cauldron filled with ice. The Witch Cauldron Cooler is made of plastic and inflates to around four-feet high. If you’ll be serving drinks over ice, make some eerie ice cubes with Bone Chillers Ice Cube Trays. The black, plastic skull and crossbones ice cube tray makes eight unique ice cubes. Don’t just serve your cooky and creepy cupcakes in regular cupcake wrappers. Instead, bake your ghoulish cupcakes in Nomskulls Cupcake Molds and use pink icing to make the tops of the cupcakes look like brains. It’s slippery and gross. It’s slime. Serve your guests some green slime at your Halloween party. The edible slime can come in the form of lime gelatin. Put the slime in some sort of Halloween-themed cups like Beware Zombies Cups. To make things even creepier, use the Gory Brain Mold to make some delectable gelatin brains. The mold holds 48 ounces of gelatin. If your party is for adults, serve your shots in Syringe Shot Glasses. These shot glasses have the look of large medical syringes and each holds one ounce of liquid. The more slimy and gross your snacks appear the bigger hit they will be. Get your thinking cap on and come up with some of your own creepy snack ideas for your Halloween party.